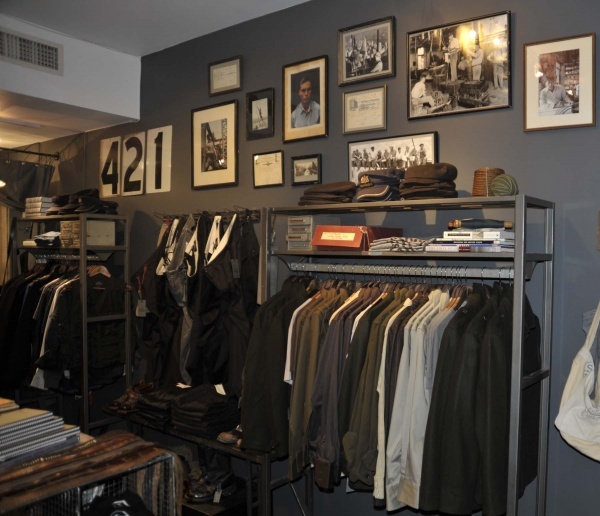 Store Room – Kai D. (New York City) | Definitive Touch - Men's Contemporary Style. I wanted a space that was functional, with modern industrial aesthetics, yet personal and artistic like a workroom for artisans. I liked the independent spirit and the diversity of the Lower East Side. The juxtaposition of old and new on the LES makes perfect sense for my launch collection which was inspired by 1930s New York and the machine age between the first and second World Wars. 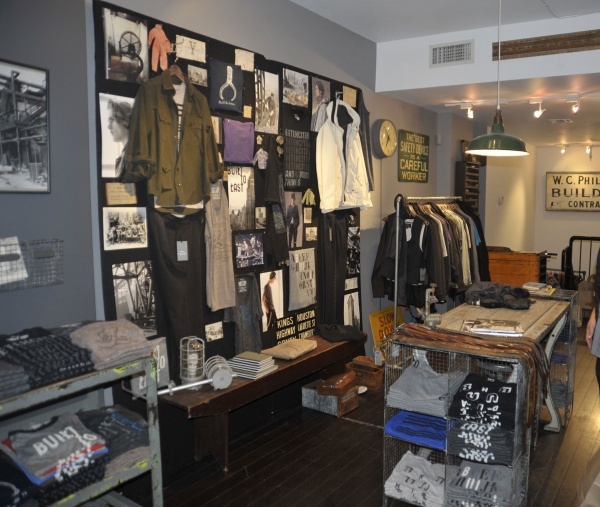 The store is painted with a color scheme of industrial grays and white. We scouted the décor elements such as the maintenance push cart (which serves as our cash wrap), vintage signs and steel work desk from various sources to achieve a nostalgic yet modern industrial look. In order to convey the feel of an artisan workroom, we displayed two concept rigging boards, which show a collage of inspiration images such as workers building the Empire State building, and actual factory documents from the 1930s. In the front window, we placed a steel desk with a built in lamp and an old factory stool to suggest a work space for someone who is an artisan as well as a builder. Lying on the desk is a stack of books with ‘Build the Future’ stamped on the spines to remind customers of our mission to build a better future.